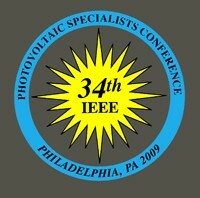 The 34th annual IEEE Photovoltaic Specialists Conference (PVSC 34) will be held at the Philadelphia Marriott in Philadelphia, PA June 7–12, 2009. The mission of the Photovoltaic Specialists Conference is to present groundbreaking research papers on all aspects of PV-relevant materials, devices, systems and applications. The only upcoming solar energy convention in Philadelphia that I'm aware of is PV America 2011. It will be held on Apr 3-5. If you want to keep up with solar conventions, make sure to sign up for my newsletter. In the March newsletter I posted links to over 60 solar energy and green expos. I see a very similar convention at the Phila convention center on the same dates. Is there two conventions that week?